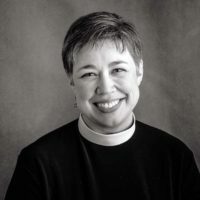 Last week, I spoke about The Way of Love practices that Presiding Bishop Michael Curry shared at General Convention. Christians use these practices to live a Jesus-centered life, and I realized as I reflected upon them, most of them are already built into my life, as I hope they are in yours. It’s up to us to determine how well we tend to the practices and how deliberate we are about keeping God first in our priorities. As one of the preachers said at convention, we know what we need to do to be closer to Jesus, to be healthy and whole . . . we just so often don’t do it. The disciples gathered around Jesus, however, are excited to tell him all that they’ve done because they’re living into the holy Way of Jesus. Just a bit earlier in the Gospel according to Mark, Jesus sent the disciples out two-by-two to exorcise demons, to anoint and heal the sick in mind, body, and spirit. They worked hard in the name of Jesus, and while they’re probably not perfect, they are excited for the work they’ve done well. Now as they gather with their beloved teacher and Lord, Jesus tells them it’s time to rest. “Come away to a deserted place all by yourselves and rest a while,” Jesus says (Mk 6:31). So, with the invitation to rest coming directly from Jesus, I expect the disciples to cross the sea or the bay and set up camp, sharing stories from their work and settling into a peaceful and quiet rest for the night. But is that what happens? Of course not. The good news of the work that the disciples and Jesus have been doing has already spread. People have noticed; they’ve been paying attention. Everyone now, it would seem, has heard about Jesus and the disciples, and apparently everyone needs something made right or whole again. The multitudes not only follow Jesus and the disciples, but they arrive in advance, too. They’re waiting for them before they get to the previously-deserted place, anticipating watching someone be healed if not being healed themselves. Even though he’s already declared that it’s time for the disciples to rest, Jesus doesn’t send the crowd away. Jesus knows the multitudes wait for him, and when he sees them, he has “compassion for them, because they were like sheep without a shepherd” (Mk 6:34). Then, Jesus teaches them, this crowd of seekers. I have sympathy for the weary disciples because I know the looks on my children’s faces when we are somewhere and someone stops me to talk or I have another event to attend before we can go home. They reach a point when they just cannot go any further, and their patience is all used up. In the part of the gospel we don’t read this week, the disciples actually decide at one point that it’s time for the crowd to leave so the disciples can eat and rest. I imagine it’s probably Peter because he has a way of saying or doing what we’re likely to do ourselves, for better or for worse. We get more of this next week–what Jesus does in the meantime among the crowd–but this week, our emphasis is on Jesus having compassion for the crowds. We read that he not only teaches the crowd on this side who need a shepherd to lead them, but he also returns to the marketplace on the other side to continue to heal those who even touch the hem of his garment. Does this mean that when it’s time to rest, if we truly want to be like Jesus, we have to keep going and run ourselves into the ground? Absolutely not. Not at all. Jesus has told the disciples it’s time to rest. Jesus didn’t say he was quitting any time soon. Even after a long day . . . after many days of healing, Jesus continues to show compassion on those who need him. The people were like shepherd without a sheep, like children without a mother, like plants without water. The crowds needed Jesus more than they knew. However earnest the disciples were, they were tired, and like us, they probably thought they should help. But for all of us, we have to rest. For all of us, we follow the rhythm of nature, resting at night, and maybe even becoming dormant for a while, while the greater energy of God breathes through all of Creation. There’s no way the disciples themselves could have taught and healed the crowds on their own, and truthfully, Jesus only sent them out to do the work they were able to do. Sometimes we get ahead of ourselves or think too highly of ourselves and think we know what God needs us to do. David’s desire to build a temple for God in our reading from Second Samuel illustrates that point. David, however joyful and grateful he was for God, thought he knew what needed to be done for God. Even Nathan the prophet thought it sounded like a good idea . . . until Nathan listened to the Word of God and received wisdom to the contrary. It wasn’t God’s will that David would build the temple but that it would be his son. We show our faithfulness in many ways, and humility is one of them. Stepping out of the spotlight is often a good idea, as we know that the glory of all our successes and accomplishments are hopefully to the glory of God. So it is when we rest and step back and let God do God’s work as God wills it, not necessarily how we expect it to be or even how we want it to be. As we participate in the Baptized for Life program, we begin with a survey that asks each of us where we are in relation to our spiritual life: how spiritually mature we feel, how well we think All Saints’/Todos los Santos meets our needs, how encouraged we are to live as faithful Christians, as disciples. I’m sure if I asked each of you what you envision for the future of All Saints’/Todos los Santos, there would be recurring themes and similarities, but ultimately you would have a particular vision of what worship looked like or sounded like, what programs we offered, and what our church building might be like. Our individual particularities add spice to our congregation and community, and I believe they also give opportunity for the Holy Spirit to show up in creativity and imagination. We need this kind of energy and possibility. But it is in the collective similarities that strengthen the bond of what holds us together. At the heart of our recurring themes for our experiences of All Saints’/Todos los Santos, I hope it is the love of God that energizes us. I hope that it is the desire for a life restored in Jesus Christ that motivates us to live The Way of Love, knowing that exactly how we do that individually is going to vary greatly. I hope it is a deep trust and faith in the wisdom of the Holy Spirit that truly unites us as the Body of Christ and keeps shaping and forming us as we grow into the children of God we are meant to be. These currents flow through us and through our congregation at all times. The presence of God is ever-present, and when we add our own spice to events–to feast days and celebrations and special occasions–God’s presence is all the more glorified. In April, when it was Earth Day, my son and I went out to the land to get some of the plants there to plant by the office door at First Christian Church. We planted some twenty plants in the area where the mulch is outside our office, and within just a few days, the leaves withered and died, leaving nothing but the mulch behind. This can happen when we transplant plants; they don’t always make it. Since then, I bought a couple of lilac twigs to see if they’ll grow (one seems to be surviving), and geraniums from the Pentecost service are now in pots by the door, giving some welcome greenery. On this past Thursday morning, as I approached the office, I noticed strange shoots coming up out of the mulch. Surely they’re not mushrooms, I thought, as they’re too tall. 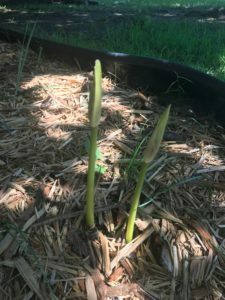 As I got closer, I was certain they’re some sort of plant, growing from where my son and I had put bulbs into the ground, the greenery having long since passed. I moved one of the containers because there were shoots trying to grow underneath it. 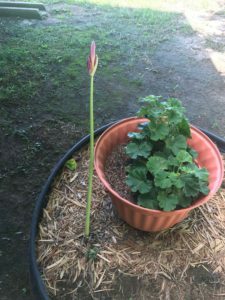 I have no idea what the plant or flower is. (Maybe by Sunday they’ll open so I can tell!) But what I can tell is that while what I could see had died and fallen away, there was still something at work beneath the soil. To me, this is very much the work of the Creator. Even in seasons of dormancy, something is at work. Even when we think our church isn’t growing, something is stirring in our midst, preparing us for what is to come in our journey. Even when we think that our taking a vacation is wasting precious time when we could be working or doing something, we are given time to sit back and rest and witness what Christ might be teaching those around us. When we rest, we are given the opportunity to be restored in our energy, our enthusiasm, and our dedication to do God’s will and to let God’s will be done. In the Gospel according to Matthew, we hear the familiar refrain: “Come to me, all you who are weary and are carrying heavy burdens, and I will give you rest.” It doesn’t say that God will rest, just that we are given rest. This rest is a gift. This rest is a necessity. This rest is part of our Way of Love, and this rest also makes way for a whole, restored life in Christ. 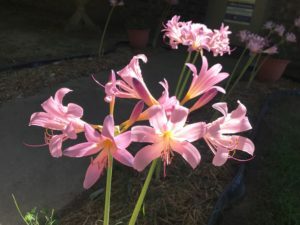 Parishioners tell me they’re called “surpise lilies.” What a lovely surprise, indeed.